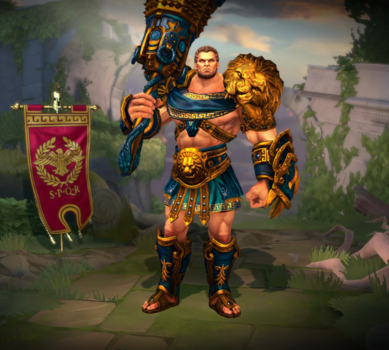 Hercules is one of the playable Gods in SMITE. Brave Hercules, a demigod son of Jupiter, born with impossible strength and force of will; for whom no task is insurmountable, no heroic deed unachievable. Yet, Like all of Jupiter's illegitimate children, Hercules once drew the ire of Juno, and though he is now known as a hero, his greatest achievements might never have been done without Juno's initial tragic involvement. The Nemean Lion captured women and devoured soldiers. Its fur was so thick no weapon could pierce it, and its claws so sharp, no armor could guard against them. Hercules tracked the lion to its mountain caves and drew it out, firing arrows that shattered against the beast's impenetrable coat. Agilely, he dodged as the lion leapt to maul him. In the end, Hercules aimed a powerful shot straight into the lion's roaring maw, a place the powerful fur did not protect, and slew it. Then, using the beasts own claws, he skinned the hide, wearing the mantle proudly as his new armor. Eurystheus was aghast upon the hero's return. Immediately the legend of Hercules began to grow. Eleven more labours the confounded king set against him, but time after time, year after year, Hercules performed what could not be done, earning fame, glory, and the peace he so desperately sought. If the boulder hits a wall, it will bounce back. Hercules was the first god released in 2013. Hercules was originally intended to be released between Bacchus and Xbalanque (likely in the week of December 3 to December 7 2012), however, Hi-Rez introduced the Focus system, and Hercules' original kit was created without said system in mind. As a result, he was postponed until after Xbalanque's release. 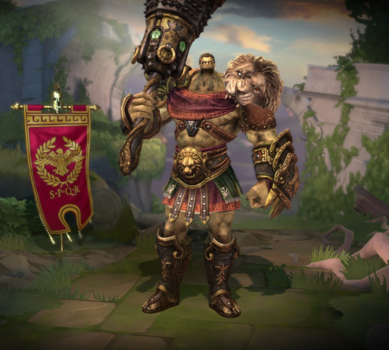 In June of 2014, Hercules received a remodel, updating all of his skins at the time, he received a skin with his released model latter. One of Hercules' jokes, "Do you even lift? ", is a reference to the internet meme Do You Even Lift?. One of Hercules' jokes, "A hero has got to be strong, got to be fast and.. er.. got to be fresh from the fight? Yeah. ", is a reference to the song Holding Out for a Hero by the singer Bonnie Tyler. Hercules' directed taunt towards Hades, "You should have learned by now Hades! ", references the myth where Hercules wrestles and defeats Hades for the life of his friend's wife Alcestis. Hercules' dance social emote is a reference to the music video for the song Gangnam Style, by PSY. This skin replaces his bolder with a baseball ball. This skin didn't had an custom Voice Pack when it was released, but got one latter. This skin was based on the large amount of negative feed back that the remodel received, including the ones saying his head looks small. This skin together with Nuclear Winter Ymir were the first skins exclusive to chests. This skin replaces his bolder with a morningstar. 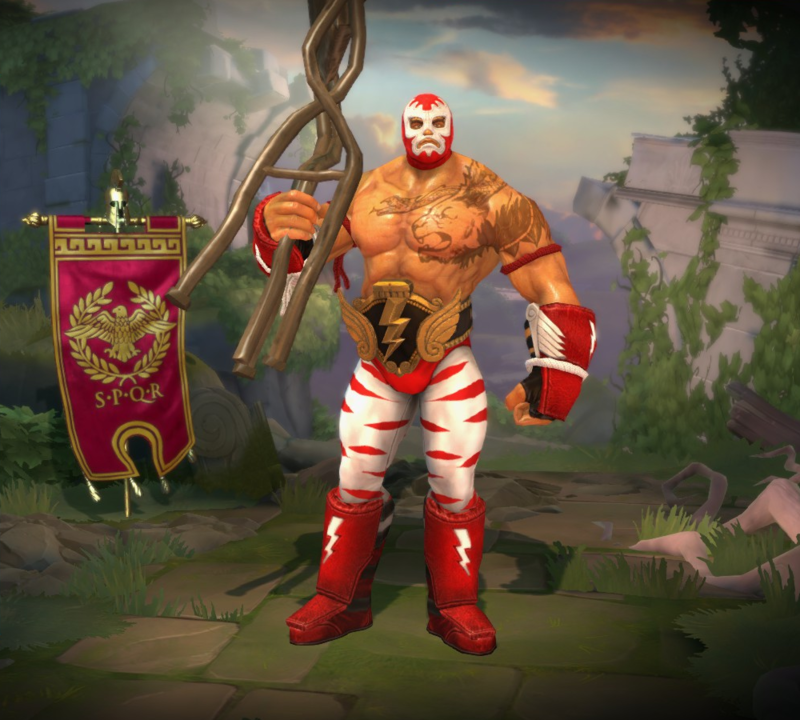 This skin is based on a Luchador. This skin replaces his bolder with a Piñata. Beach Babe Aphrodite can be seen in the background of this skin card art. This skin replaces his bolder with a beach ball. This skin share its theme with Sun Kissed Amaterasu, Beach Babe Aphrodite, Life's a Beach Geb, Pool Party Jing Wei, Chef's Special Khepri, Challenger/Ace Nu Wa, Poolseidon Poseidon, SPF 666 The Morrigan and Land Shark Sobek. This skin was based on the movie Mad Max. This skin replaces his bolder with a mash of destroyed cars. This skin share its theme with Wasteland Cu Chulainn, Warlord Kumbhakarna and Badlands Vulcan. This skin replaces his boulder with a planet. This skin share its theme with Gemini Agni, Cosmic Power Anubis, Galactic Void Chenobog and Nebula Medusa. This skin is based of his original Default skin prior to his visual update. The skin is voiced by Kevin Sorbo, famous for starring in the Hercules: The Legendary Journeys television series. 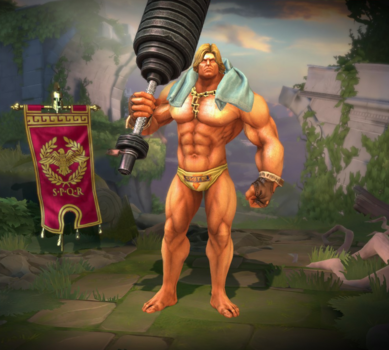 This skin share it's theme with Old Wa Nu Wa. This skin is based on a Knight. 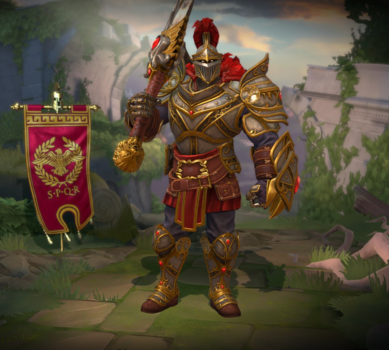 This skin share its theme with Knight of Wisdom Athena, Royal Champion Awilix. This skin comes with the Cosmic jump stamp and the Cosmic fountain skin. 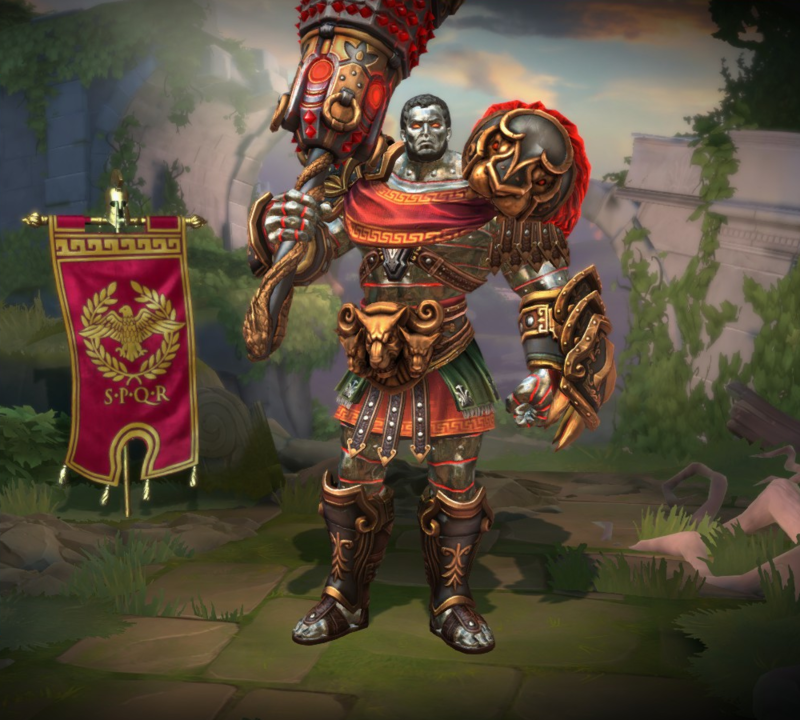 This skin was a special reward for any players that completed the 10 Million Celebration achievement (Win 10 matches during the 10 millionth player celebration) during August 2015. 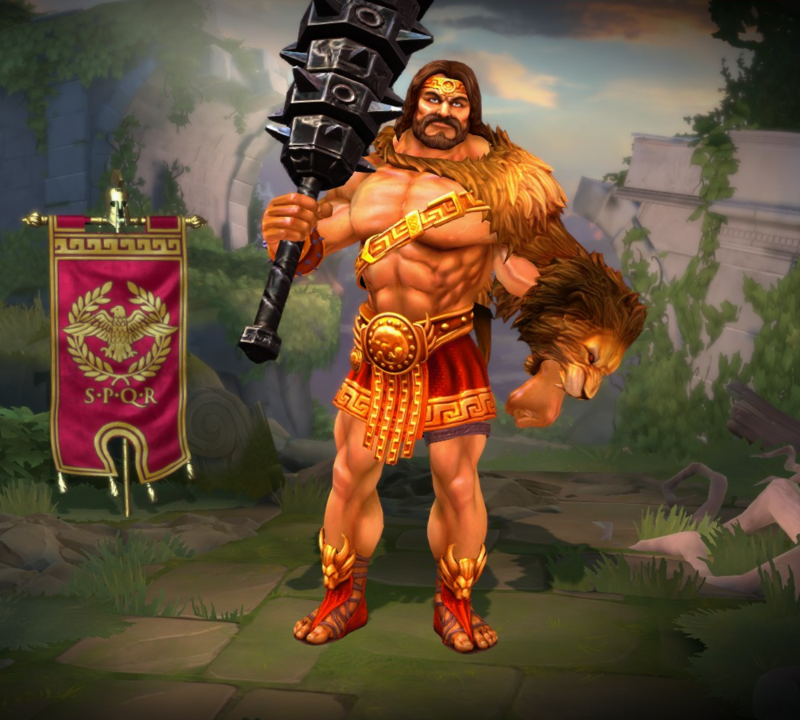 Completing this achievement also unlocked Hercules himself (if not owned), and his voice pack (if not owned). This skin can only be obtained by purchasing the Dungeon Bundle from the Trials of King Hercules event. Decreased Cooldown from 90 → 90/85/80/75/70s. Targets hit by Driving Strike no longer lose their hitbox while being pushed by Hercules and can be damaged. Increased Cooldown from 15s → 17s. 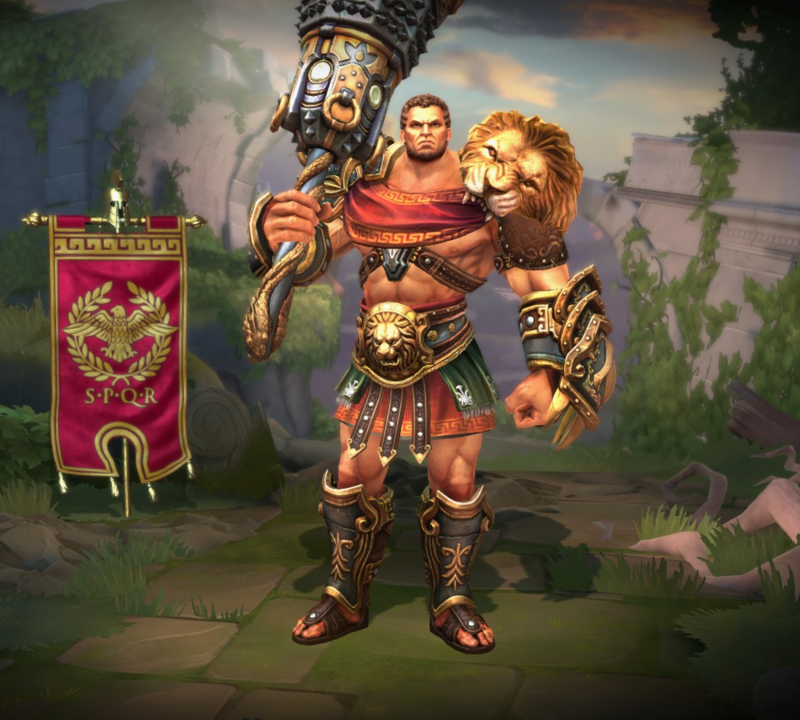 NEW: Everytime Hercules takes Damage from Gods, he gains 5 Physical Power +1 multiplied by your level, stacking up to 3 times and lasting 5s. Decreased Mana Cost from 70/75/80/85/90 → 60/65/70/75/80. 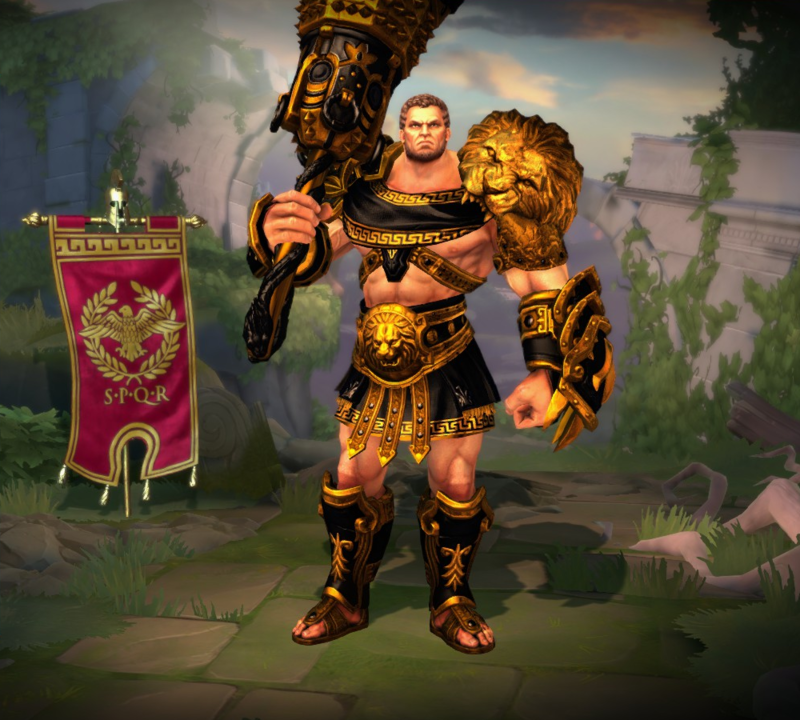 NEW: When activated, Hercules heals himself instantly and then heals himself again for a % of damage taken after 4s. Also, Hercules gains Bonus Magical and Physical Protections for the duration. Heals for 30/40/50/60/70% of damage taken after 4s. Decreased Cooldown from 17s → 15s. Decreased Mana Cost from 60/65/70/75/80 → 60 at all ranks. Increased Damage from 60/110/160/210/260 → 80/125/170/215/260. Increased base Movement Speed from 370 → 375. Increased base Attack Damage from 35 → 39. Increased Physical Power buff from 30 + 1 per level → 30 + 2 per level. Reduced cooldown from 15 → 14. 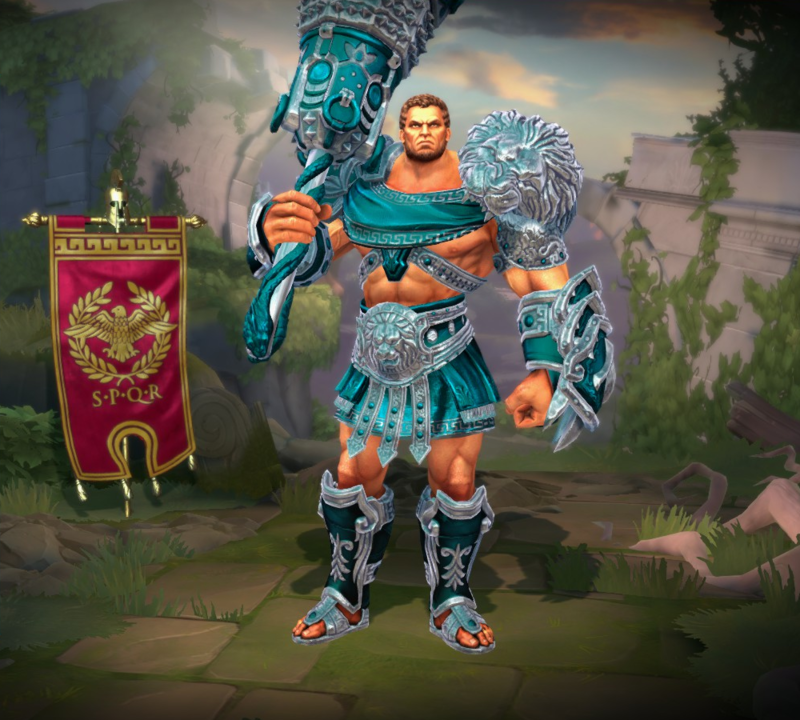 Fixed Retrocules skin showing a line down his body at low settings. Fixed boulder not showing up at extreme distances. Fixed inaccuracies with ground targeter causing targets to not get knocked up. Fixed an issue where Hercules could not pull targets over Medusa statues. Fixed not hitting if targets were partially in a wall. Fixed Petrified statues always showing with a shrunken head. Updated his basic attack hit fx. Fixed a bug that created strange interactions with this ability and other knockbacks. Damage returned as healing reduced from 40/60/80/100/120 to 30/50/70/90/110. This ability no longer causes Knockback on the initial hit. Attack Speed per level reduced from 1.26 to 0.8. Casting time reduced from 0.233 to 0.1s. 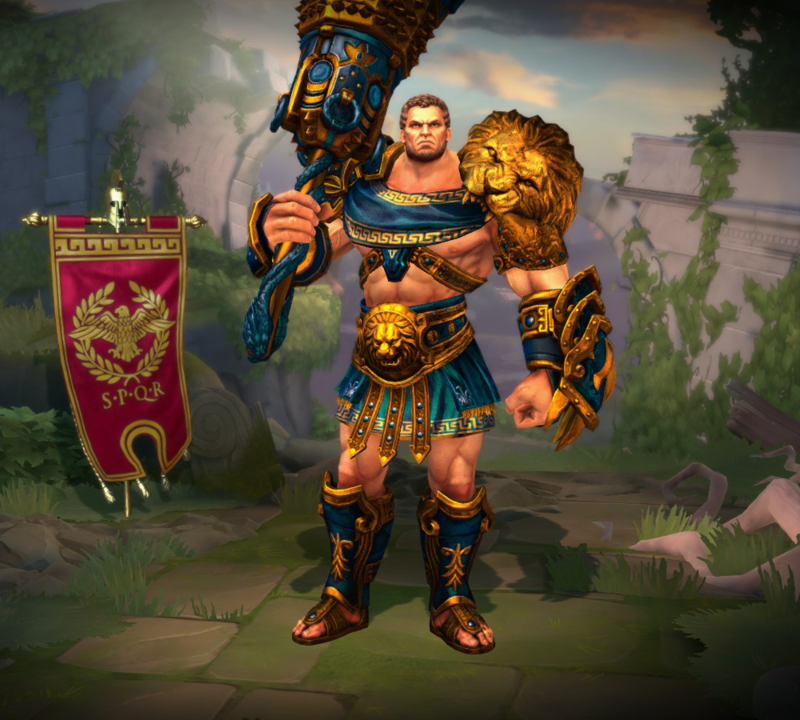 Hercules is now immune to Knockback in Driving Strike. Note: This gives him precedence against other dashes not immune to knockback. 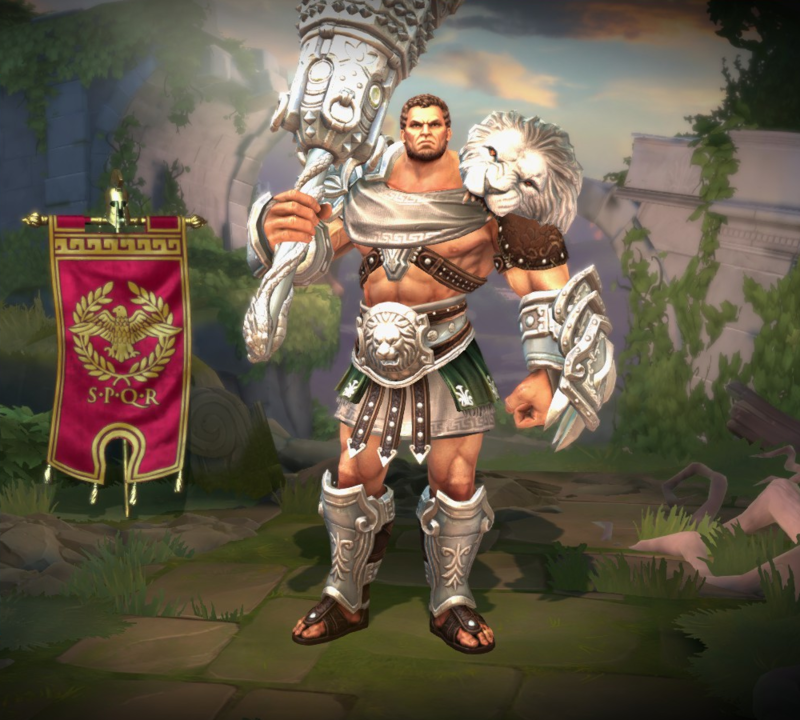 Hercules is now crowd control Immune during the casting time of this ability. Post-Hit Delay reduced from 0.35 to 0.1. 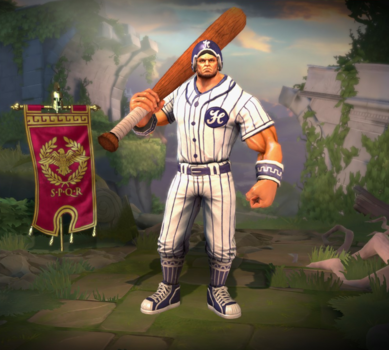 Updated targeter for Grand Slam skin. Width increased from 5ft to 7ft. Increased area for flip-back by 2ft. Fixed an issue that could cause Hercules target to become permanently rooted. Fix ground target so it now matches actual ability range. Fixed an issue where targets could jump to avoid being tossed. Fixed a bug where he could momentarily go invisible when firing. The health requirement of 50% or below has been removed from this ability. The stun will now always be applied. Fixed an issue in which Earthbreaker would deal improper damage when playing local solo practice missions (did not affect regular matches). The range of this ability has been increased from 40 ft to 45 ft. This ability now heals for 15/25/35/45/55 every second for 4 seconds when initiated. The percentage damage done within the 4 seconds that is returned as healing has been changed from 30/55/80/105/130% (+1% for every 2% health missing) to 40/60/80/100/120% (without additional scaling). The amount of additional physical power based on a percentage of his missing health has been increased from 20 (+2 * your level) to 30 (+3 * your level). The cooldown on this ability has been changed from 20s to 15s. The base damage of this ability has been increased from 200/300/400/500/600 to 300/425/550/675/800. Cooldown has been increased from 15s to 20s. Cooldown has been increased from 12s to 17s. Fixed an (awesome) bug in which players would spawn as Hercules’ rock. Fixed an issue where the damage was applying instantly instead of when the rocks hit enemies. The radius of the boulder has been increased by 50%. The damage reduction from getting hit by the rolling boulder has been removed. Hercules has been added to the game. This page was last edited on 12 April 2019, at 16:33.